For a while, I folded kusudamas all the time. I only folded models that required square paper, no glue, no cut. I don’t exactly remember the models presented here. I think the ones on the upper left and middle center are the model in the book from Rick Beech – that’s the first 30-modules model that I folded, it got me hypnotized and I folded it many, many times. The bottom left looks like a regular sonobe. 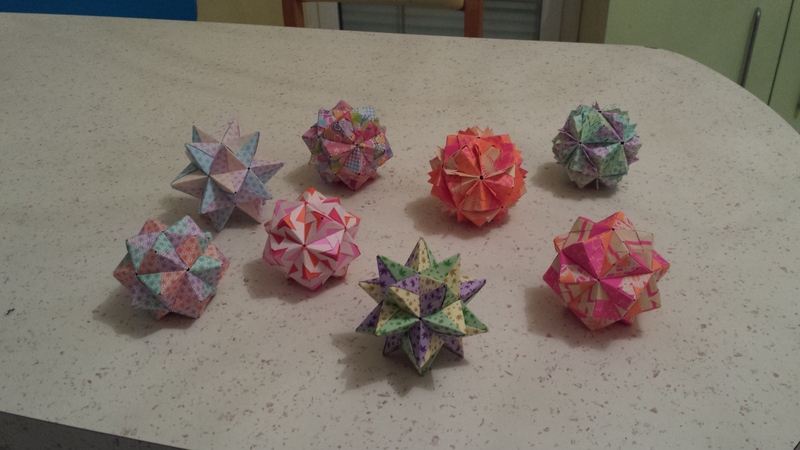 They are all folded from 7.5 cm paper. The fluorescent paper is “Origami mini-Pop” from Avenue Mandarine. The two on the left and the upper right are Showa Grimm “1000 cranes” (I love this traditional japanese pattern, here in non-traditional colors). The middle left is Toyo 50 colors. The upper middle left is double-sided chiyogami. The front center is really cheap chinese paper from ebay.